Located in the high desert of Southeast Arizona, between the Peloncillo and Chiricahua Mountains, lies Apache Elementary School. 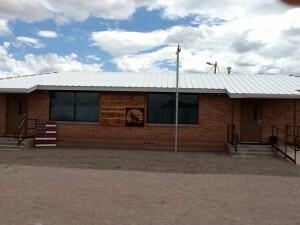 One of four remaining one-room schools in the state, Apache Elementary provides K-8 education to the children of ranchers, farmers, and others in this sparsely populated area of Arizona. Apache Elementary School exists to provide quality educational experiences for this community’s children. The school staff and the Board of Education work together to define and implement quality educational practices. We are ever mindful that this school exists for children. Its purpose is to provide opportunity for children to develop skills necessary for productive lives. It is our mission to so arrange the school organization, its structures, rules, procedures, policies, and course of studies so that each child can learn at his or her maximum rate.